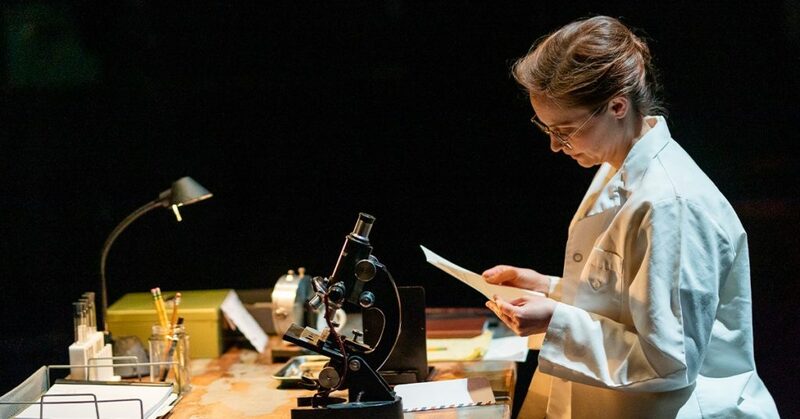 (Cambridge, MA) Photograph 51 is depressing – not because it’s a depressing play, but because it tells us (STEM researchers, women, women within STEM, etc.) how little progress towards gender equality we have made since Dr. Rosalind Franklin discovered the structure of DNA. Her work, her words went largely ignored and men took all of the credit for her work. This is disturbing. That women in STEM are still silenced is even more so. There exist many articles and books on this fascinating scientist. Photograph 51 examines Dr. Franklin’s (Stacy Fischer) working relationships with scientists Maurice Williams (Barlow Adamson), beleaguered grad student Raymond Gosling (Josh Gluck), Donald Caspar (Jesse Hinson), James Hinson (Michael Underhill), and Francis Crick (John Tracey). Dr. Franklin’s cohorts narrate her discoveries and setbacks. The men perceive themselves as average blokes; they perceive Dr. Franklin as a truculent old maid who can’t take a joke. Dr. Franklin doesn’t want to perceive anyone; she wants to work. History tells us that she accomplished great things in her 37 years, and so did they. Central Square offers another play with great ensemble work. Adamson, Gluck, Hinson, Underhill, and Tracey do much of the fancy footwork around Fischer. She exists at the epicenter of the play and the men rotate around her like genius moons. It was so engaging that I forgot it was live theatre. Fischer charges through this production like a heat-seeking missile. We know her objectives from the moment the play opens until the play closes. She persists through the weight of Franklin’s trials to come out evenly balanced with her male colleagues. Adamson is a gently patronizing Wilkins. He represents the man who nudges you away from “men’s work” out of concern for your future. He isn’t aware that he’s impeding your life’s course but his influence negatively impacts your career. Adamson’s performance pissed me off and it’s not his fault. I was not able to distance myself from his performance. He so reminded me of past employers that I reacted with visceral anger. The scenic design by Kristin Loeffler is in stark contrast to the sound design by Elizabeth Cahill. Loeffler gives us an uncluttered lab space encompassing the center of the theater that harkens back to a time before large, clunky computers and robotic arms. Cahill’s sound drags us promptly to the modern day with feminist anthems to a pop beat. Both indicate that we have so much farther to go. It’s a marvel that Fischer and her male co-stars are able to work through this depressing material. Unlike Truth Values or The Women Who Mapped the Stars, Photograph 51 is not uplifting. Dr. Franklin’s story is already written. The audience has to make its own hope. Rather than get bogged down by Dr. Franklin’s tragic misfortunes, we must look to ourselves to make STEM better for women and girls now. My date to the March 18 performance suggested that perhaps Dr. Franklin was so disagreeable because she was living with two giant tumors in her uterus. I counted that a woman of the 1950’s had to counted sexist BS with a stern backbone. We both posit sound theories. The amount of untreated pain Dr. Franklin must have endured rather than be labeled unfit for the lab (because they were already calling her that) must have been immense. Modern audiences may suggest that Dr. Franklin didn’t want to collaborate with her colleagues. I counter that she didn’t want to collaborate with anyone would wouldn’t take her work seriously. 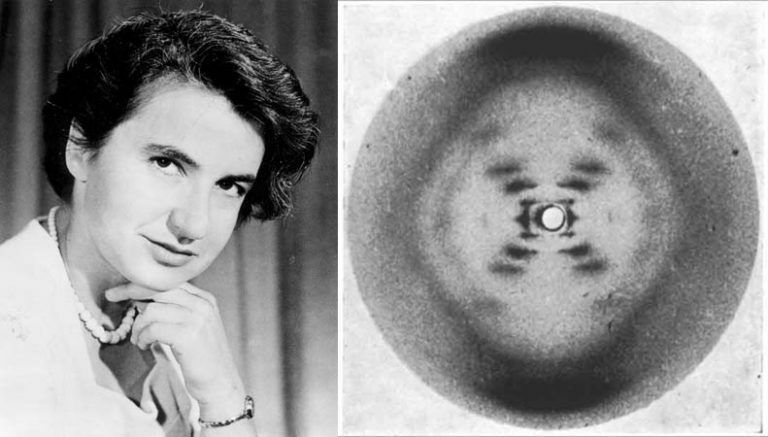 Rosalind Franklin (1920-1958) and a picture of her crystallographic x-ray of her DNA research. This entry was posted in Drama and tagged 2019, Anna Ziegler, Barlow Adamson, Brit d’Arbeloff Women in Science Production Series, Catalyst Collaborative@MIT, Central Square Theater, DNA, Elizabeth Cahill, gaslighting, Jesse Hinson, John Tracy, Josh Gluck, Kitty Drexel, Kristin Loeffler, Maggie Hall Photography, March, Michael Underhill, Photograph 51, Rebecca Bradshaw, Rebecca Schneebaum, Rosalind Franklin, Stacy Fischer, STEM, The Nora Theatre Company, victim blaming, vintage sexism by Kitty Drexel. Bookmark the permalink.